A: Intellectual Property (IP) ascribes the legal right that exists in products of human creativity. IP is divided into two categories: Industrial property, which includes inventions (patents), trademarks such as your logo, company name or slogan, industrial designs; and Copyright, which includes literary and artistic works such as novels, poems and plays, films, musical works, drawings, paintings, sculptures, photographs and architectural designs. Therefore, anyone who has created an idea, be it a brand, a design or any artistic or literary work will want to protect their Intellectual Property Rights (IPR) in order that their idea is not stolen or used without their authority. Q: What rights do I have over my Intellectual Property? A: IPRs arise either automatically or on registration. Examples of the former are copyright, design right or database right. Examples of the latter are patents, registered trade marks (logo etc) and registered designs. IPRs entitle the owner to prevent others from using or misusing the subject of the right. Q: What do I do if someone is infringing my Intellectual Property Rights by using my logo, name or designs for example? A: If you discover that someone is using your IPRs then you can look to sue them for such an infringement in order that they cease to infringe your rights and / or to claim damages or account of profits for the unauthorised use of your IPR. Q: What if I am accused of infringing someone’s’ Intellectual property rights? A: In the same way as we act for those whose rights have been infringed, we also act for clients who have been accused of infringing others rights. We will assess the strength of the other side’s case with our clients, advise on any potential infringements and discuss what our clients should do in order to avoid getting sued and / or to minimise any claim made against them. As in any form of litigation, just because someone has accused you of something does not necessarily mean that they have a right to sue you or that they will succeed in the claim against you. We will advise our clients of their rights and any potential defences that they may have in the event that a matter does go to Court. 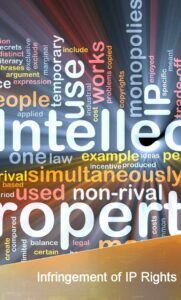 Q: What is A City Law Firm Limited’s approach to litigation over Intellectual Property Rights? A: For many claims, the IPRs of the parties are clear and the prospect of asserting IPRS and avoiding litigation may be available, by alternative dispute resolution, whether by mediation, negotiation or arbitration. However, some claims for infringement of the registered IPRs may not properly disclose a proper claim, legal right to damages or an injunction and thus may be defended to minimise or avoid liability altogether. Protect you logo. slogan, name and other trademarks by making an application to register them today. Share the post "Infringement of IP Rights"